For anyone who doesn't know, Ken St. Andre is the creator of the classic roleplaying game Tunnels & Trolls, one of the first RPGs in existence. He's a long-time Phoenix resident and local celebrity, often lending his advice and wisdom to other game designers and game masters. 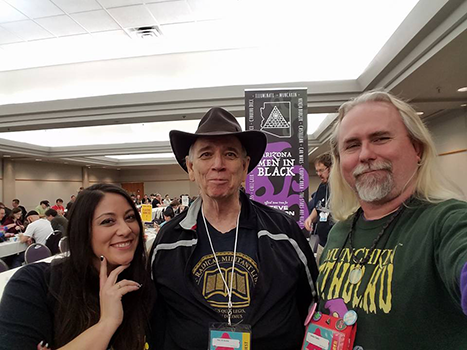 Earlier this year, he took a trip to Gateway 2017 in Los Angeles, where I was honored to GM his first GURPS game. His vast knowledge and unconventional tactics were a life-saver for his overwhelmed party of adventurers. Ken recently relaunched Deluxe Tunnels & Trolls via Kickstarter and is busily promoting it at local and national conventions. Ken, pictured here in his signature hat, is sometimes seen gaming with veteran Arizona MIB Jessie Foster (that's me, on the right!) and world renowned MIB Kat Rider, who (in her copious spare time) co-hosts the Uninvited Gamers podcast. If you can catch Ken at your convention, he's always a blast to talk to. And if you're with a gaming convention, you should invite Ken as a living legend in the industry.